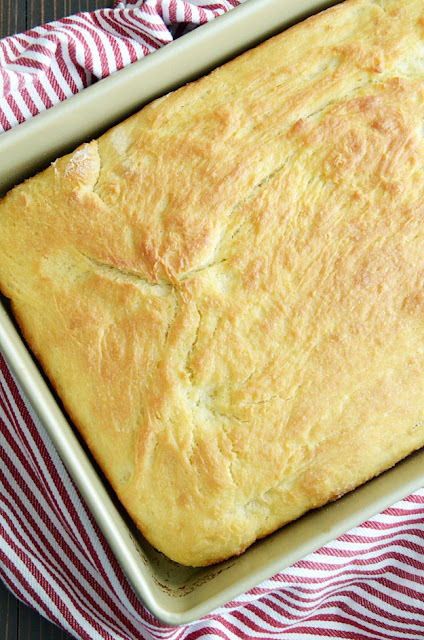 This soft, buttery, homemade bread is so easy to make and tastes like a fluffy biscuit! We ate this at a friend's house for dinner a few months ago, and let me tell you-- I had never had anything quite like it! I was obsessed after the very first bite-- it's buttery and soft and incredible. Warm and fresh out of the oven, it almost tastes like you're biting into fluffy, homemade biscuit. Once it's cooled completely, it's the perfect texture for sandwich bread. And after it's stale, it makes the best French toast I've ever eaten! Plus, it's SUPER easy to make. If you have a fear of yeast and homemade bread, don't let this one intimidate you. Honestly, it's fool proof! Prepare a 9x13 baking dish by greasing it with nonstick cooking spray. Set aside. In a mixing bowl, dissolve the yeast in the warm water. Add the sugar and salt. Let sit until foamy (about 5 minutes, tops). Add the flour; mix and knead until dough is smooth (you can do this by hand or with a dough hook on a mixer). Cover and let rest until dough has doubled in size (I speed this up by placing the bowl on a heating pad; otherwise, it's about a 45 minute rise time). Meanwhile, preheat the oven to 400ºF. Press dough into the prepared 9x13 baking dish. Pour melted butter over the dough. Bake for 20-25 minutes. Let cool slightly before cutting.